Did you know that according to Feeding Tampa Bay, nearly 25% of children in the Tampa Bay region are food insecure? Shorecrest is stepping up to help The Kind Mouse and Pinellas County families. 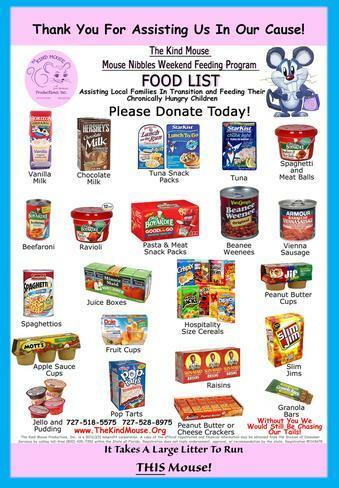 The Shorecrest fall food drive runs from September 6th to December 6th, we will be collecting food donations for The Kind Mouse, which has various programs to help families survive by making sure no one has to go hungry in Pinellas County. Bins are set up in each school as well as the Admin Building. Look for clear bins with a Kind Mouse sticker. Also, please see attached picture for full list of items needed for donation. Lower School has divided up the items by grade level. More info on that coming soon!